If ever there were a sentence that seems out of place in an otherwise wonderful statement of the church's understanding of human beings and of human sexuality it is this sentence found in the middle of paragraph 161g in the Book of Discipline. We are all individuals of sacred worth. We all need the ministry of the church. We are all recipients of God's grace. We all deserve to be welcomed by the church and included in its ministry. The statement "the United Methodist Church does not condone the practice of homosexuality and considers this practice incompatible with Christian teaching" stands out as a big "but" that seems to nullify all of the other statements. If only we could have left it that all people are of sacred worth, with no buts, with no one excluded. Beginning on Saturday, February 23rd the special session of General Conference will once again grapple with how we as a church can truly treat everyone as individuals of sacred worth. While I don't expect that everyone will be on the same page regarding homosexuality it is my hope and prayer that we will agree to stop discriminating against our gay members and truly welcome them as people of sacred worth, no buts! My prayer is that love will prevail in all of the discussions and that we will truly love our neighbor as ourselves, including our homosexual neighbors. Please join me in praying for all of the delegates, for the movement of the Holy Spirit, and for the future of the United Methodist Church that we might somehow be both a just and a united church. 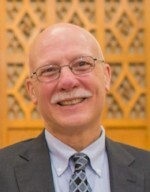 I would encourage you to mark your calendar now for Monday, March 18th at 7:00pm when we will host a District Conversation led by our District Superintendent, Jim McPhee, at which time we will be able to get a better idea as to what the decisions made at this special session of General Conference will mean for our Conference and our church. Theme: Taking the High Road- How do we respond to those who mistreat us? Do we respond in kind? Jesus shows us a better way in his "sermon on the plain". This week's opportunity involves volunteering to assist with the Bean Supper that will take place on Saturday, March 2nd from 4:30-6:30pm. Did you know that you can volunteer on Friday morning to help with preparation as well as on Saturday evening to serve food, wait on tables, or even wash dishes? Help is always needed so why not give Joyce Tagliaferro a call and let her know that you don't want to miss out on this wonderful opportunity. Joyce can be reached at 889-5707. "Connected" is a monthly newsletter/bulletin designed to put Methodist Conference news directly into the hands of local church members. Get the latest issue here. Please join the F Troop, our over 40 fellowship group, for a pot luck supper and a movie. There will be cherry pie to celebrate Washington's Birthday, and because we like pie! We will eat supper and then enjoy a movie, so feel free to bring some popcorn as well! A sign-up sheet will be posted on the bulletin board beneath the clock in the vestry to let us know what you would like to bring. We hope to see you there! Please bring your donations to the church on Sunday mornings and leave them on the steps near the Education office, clearly labeled for the book sale. If you cannot bring them on Sunday morning, please speak to Mavis Pyle or Bonnie Williams about when you can drop them off. No encyclopedias, textbooks or National Geographics, please! And if you are someone who loves to underline, highlight, and notate in the margins of your books, but no longer want them, please discard or recycle them-others do not really want to know your thoughts and what was important to you may not be important to them and is a real distraction from enjoyment of the book. Thank you. Back on Veteran's Day, Donna Swanson, who is the NH Coordinator of the Quilts of Valor program presented quilts to both Redding Thompson and Steve Rogers. 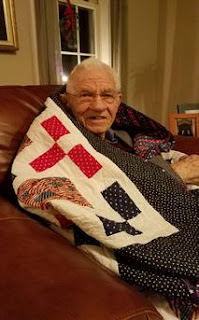 She had hoped to present a third quilt to Jim Hinkle on that day as well but Jim was in the nursing home at that time. Thankfully, on Christmas Eve, Jim finally received his "quilt of valor" recognizing his year's of service to our country in the United States Navy. Thankfully Jim is now back home and was even in church recently for which we are grateful. Souper Bowl of Caring: You filled those soup pots with over $373 for our food pantry. Thanks for the youth who encouraged you to fill them and to all of those who did. Thanks to our soup cooks and those who bought soup, another $185 was raised for our food pantry at the Nashua Soup Kitchen. Souper! Often a purchase of $50 at the food bank will fill three cars with 1500 pounds of food! Food Pantry: Thanks to those who pick up, bag and distribute the food, recycle boxes, and staff the computer, and for your donations of food and money to purchase food from the NH Food Bank. Most needed items right now include soup, cereal, snacks, canned or dried beans, and even Ramen noodles! Thanks to Al James for creating a sign for our third Sunday Methodist Food Pantry at the Nashua Soup Kitchen. Our next food pantry will be on March 17 from 2 to 4 at the Soup Kitchen. If you can volunteer, please meet us at 1:30 at the Nashua Soup Kitchen, 2 Quincy Street, about a block from our church! Hoodie Sunday: Thanks to all who brought a new or gently used hoodie to church on February 17. They will be shared with our refugee community as well as Café Agape friends. Following the Special Session of General Conference that was held February 23-26 there are lots of questions as to what the implications of the decisions made will be for our annual conference and for the churches that make up the United Methodist Church. In order to provide opportunity for members of our district churches to have "courageous" conversations our District Superintendent, Jim McPhee, will lead us in discussion on Monday, March 18th at 7:00pm. We will be hosting this session here at MSUMC and will need volunteers to help with refreshments, sound, projection, and greeting. If you are willing to assist please let Pastor Rich know asap. A second session will be held on Tuesday, March 19th at 7:00pm at in South Portland, Maine. Welcome to our March Finance and Stewardship column. This month I would like to bring up grants through the United Methodist Foundation of New England. This is the season of grant writing, often with applications due June 1 or September 1. For more information, you may Google grants or specifically go to http://www.umc.org/resources/grants-and-loans-available-through-the-united-methodist-church. Some of the descriptions below are directly quoted from the respective websites. Youth Service Fund and Grants for Ministries for Young People have a June 1 application deadline. The UMC website has hints for grant writing as the first is outside the UMC. Grants for Ministries with Young People funding are for creative, innovative approaches to ministries for, with, and by young people. There are also scholarships on this site. For example the Richard S. Smith Scholarship is for minority youth active in the church. Once our young scholars gain acceptance to college, there are numerous grants for research and papers. Church and Society organization has 3 grants. Ethnic Local Church Grants (ELCG) Program is to provide grants to strengthen the ethnic local church. Human Relations Day Grant is to provide funding to promote ministries that respond to non-violent young offenders through education, advocacy, or leadership training and development. Peace with Justice is geared towards efforts directed at world peace – from education to national policies. Unitedmethodistwomen.org has various grants for national and international ministries, often geared for lifting women and children out of oppression. Their mission focus for 2019 is "Building a Thriving Generation of Children and Youth Worldwide." There are other grants on the above sites, and of course elsewhere. Please feel the inspiration and take a look. Our existing church leaders should have such grants in mind. However this may be an opportunity for an emerging leader who hears a calling from God to look into new directions where we can serve! "The purpose will be to receive and act on a report from the Commission on a Way Forward based on the recommendations of the Council of Bishops. The Commission was authorized to examine paragraphs in The Book of Discipline concerning human sexuality and to explore options to strengthen church unity." If you would like to know more about the proposals that will be coming before the conference please plan to join us on Sunday morning at 9:00am for the Adult Sunday School class. We will be viewing a panel discussion in which four individuals will speak to the particular plan that each feels is the "way forward" for our church. Summaries of each of the plans will also be provided. You can also find out more by going to the web site, http://www.umc.org/topics/general-conference-2019-special-session. There is lots of information available that will help you to begin to see the complexities, challenges, and opportunities that will be provided by this gathering. Theme: What we think of as the "beatitudes" or blessings, whether in Jeremiah's version or that of the Gospel of Luke, actually include both blessings and cursings. It is not that God blesses or curses particular individuals but rather that the way of life that is chosen by each either results in blessings or curses depending on what we choose. The choice is ours! This week's opportunity involves volunteering at the Nashua Soup Kitchen for the food pantry ministry. On the third Sunday of each month our Hunger Ministry volunteers open the food pantry at the Nashua Soup Kitchen in order to provide opportunities for those who are unable to go to the food pantry during the week. Our volunteers will be there from 1:30-4:00pm on Sunday. Please speak to Phyllis Appler if you would like more information or just show up! Volunteers are needed at the Soup Kitchen during the week as well as on our third Sunday. Third Sunday volunteers should arrive at the Soup Kitchen at 1:30 to set up for our food pantry, which runs from 2 to 4. During the week, Monday through Friday, volunteers work from 11 a.m. to 2:45 p.m., distributing food, working at the computer checking folks in, unloading produce and nonperishables, even handing out numbers. Even if you can just manage a couple of hours from 11 to 1 or 1 to 3, especially on Thursday or Friday, that would be a great help. We have a blue Heart of Nashua Food Assistance Ministry apron waiting for you! On Sunday, February 17, we will encourage you to bring in a new or gently used hooded sweatshirt. These seem to be the most popular items that newly arrived teens and young adults need to stay warm and comfortable in New Hampshire winters and chilly springs. Our Café Agape friends also find them very useful. You may bring hoodies in sizes from kids to teens to adult, both men's and women's. And if you would like to wear a hoodie that day yourself, feel free! Please join us for this 7-session evening Lenten Study, based on the book Give Up Something Bad for Lent by James W. Moore. Each session features a Scripture reference, a personal reading, questions for personal reflection or for group study, and a closing prayer. Description of Study: "During Lent each year, Christians give up something as an act of sacrifice and spiritual discipline. James Moore challenges us to … give up something we are better off not doing. He invites us to seek God's help to focus on eliminating one habit or attitude that is destructive. Imagine giving up envy, jealousy, self-pity, apathy, procrastination, gossip, resentment, or negative thinking." 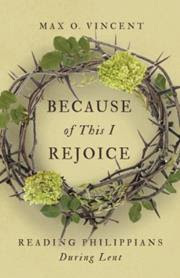 He encourages us to replace it with a positive habit and to "embrace the good news of Easter." At this time we don't have a definite focus for the gathering, but important decisions will be made for future events that the group will hold. We hope to see a good number of women there to help in the planning process. We have an inventory on hand for immediate purchase, with a catalog for special orders. We are currently taking orders until April 15. These will be available for pick up by early May. Stop by our display during Coffee Hour to see our current stock, or pick up a catalog to choose books, soup and dip mixes, gift ideas, and many other items. I am happy to announce that Susan Mead will be coming to Main Street United Methodist Church. Susan is a community educator and outreach director for Greater Nashua Mental Health Center. We have asked for training in de-escalating situations that may arise in the Cafe. She has willingly agreed to come and talk to us. Susan has spent many years in the mental health community and in Nashua. She knows many of those who frequent the Cafe. She knows their needs and the issues they deal with on a daily basis. She loves what she does and is looking forward to sharing some of that knowledge with us. She will be providing training to Cafe Agape volunteers and any church members who might be interested. This is a wonderful opportunity for anyone in our congregation. Please join us. Please let me know if you are able to attend by Sunday March 3 so we have enough materials for everyone. For as long as I can remember since becoming pastor of the Main Street UMC I have heard a variety of people express the same concern- "what can we do to attract and retain more youth and their families in our church?" Last year a sub-committee of the Staff Parish Relations Committee and the Education Committee met over the course of many months to consider what the staffing needs of the church are as we enter this new era in the life of the church. Out of this time of exploration and reflection came the proposal to create two new positions in place of the former Director of Christian Education position that had served the church so well for over 30 years. One position would focus on youth and the other on intergenerational ministry. Once approved by the Staff Parish Relations Committee and the Church Council we began to advertise these positions and are pleased that the Coordinator of Youth Ministry position has been filled and the Coordinator of Intergenerational Ministry has had some serious interest expressed in it. Recently we formed a Youth Advisory Council consisting of youth, parents, other church adults, along with our youth group leader, Joe Dechene, and Karrie Lam, our Coordinator of Youth Ministries, and myself. We had an excellent turn out for the organizational meeting and will be meeting monthly to plan youth related activities including a youth mission trip that we hope will take place in July. Karrie brings both enthusiasm and new ideas to our youth ministry program and we look forward to her leadership in this area for the foreseeable future. As the article on the "loaves and fishes" program found below indicates we are asking those who have a passion for the work of youth ministry and a concern for the youth of our church and community to step forward in supporting this position. Already we have witnessed a generous response that indicates that we are ready to "put our money where our mouth is"! Thank you to everyone who has given to this end. We trust that we will see many fruits from this new ministry and staff position. I would ask you to pray for our youth and for Karrie and Joe as they work closely in ministry to, for, and with them. Please feel free to offer to them your ideas, your support, and your time as well. Theme: The Superiority of Love- What place does love have in how we live out our faith as individuals and as the church? The apostle Paul is clear that love must have a central place in any expression of faith that is authentic and true to our calling as Christians. Paul goes on to define what love looks like in very practical terms. Dare we give love a central place in our lives and ministry? This week's opportunity involves the Ham and Bean Supper that will take place tomorrow evening, Saturday, February 2nd. We can always use more waiters, servers in the kitchen or with clean up. If you would like to volunteer please give Joyce Tagliaferro a call at 889-5707 or just show up by 4:15 to help with the dinner or 6:30 to help with clean up. Thank you in advance for your support. February has traditionally been the month that Main Street celebrated Scouting Sunday for boys and sometimes also girls. For decades BSA Cub Dens, Cub Packs and Boy Scouts Troop 6 were a part of life at Main Street. Many Eagle Scouts have come out of Troop 6. To continue our 150th celebration, a display about scouting at Main Street will be out in the first floor lobby. If you have any memorabilia, boy scout or girl scout, that you would be comfortable sharing just for the month, please be sure your name is on it and leave it in the church office or give it to Pam Breniser. Be sure to stop by and take a look as the display grows. Hello, Joe from Finance committee. For February I want to get your ideas for fundraising. Our 2019 operating budget (general fund) is just about $450,000. As I described in previous columns in more detail, most of that money goes towards salaries, facilities, and missions. It keeps the place open which is the basis for all the volunteer work we do. Of that $450,000 we estimated $8900 or 2% would come from fundraising. You may be asking, "Why do we obsess over 2%?" The answer is that it's still $8900! Our operating budget is so tight, that when we get to the end of the year and we are short $8900, it really hurts! Such a shortfall would force an unpleasant adjustment to our services. Our principal fundraising is our ham and bean dinners. Admittedly it takes a lot of work to put on these dinners (and clean up afterwards) but it does contribute considerably. Hopefully we will continue with those dinners as part of an overall fundraising approach. What other fundraising ideas can you think of? Ideally it would provide sufficient funds for our ministries and missions, without taking so much effort that fundraising takes away our focus. Some ideas that come to mind are concerts, pancake breakfasts, spaghetti dinners, and ethnic events. For each of these events we would need a leader to organize and rally the team. If you feel like leading one of these fundraisers, please see Pastor Rich. Not all fundraisers would are in keeping with our core values as a congregation and might not be allowed and some fundraisers we cannot do in the United Methodist Church. For example we could not sanction gambling related fundraisers. We also could not allow businesses to permanently set up on church property, with the intention of us taking a cut. While we had advertising in the program for our 150th anniversary, we shy away from paid commercial advertising on the property. Any fundraising idea would have to be in line with the message of our church. Please let us know your ideas, and more importantly, if you want to lead a new fundraiser. Christmas Thank You: Thank you for making Christmas special for several of our new refugee families. The tags disappeared quickly from the tree, and every child received four very generous gifts. Twenty-four of our refugee families received gift cards for Christmas dinner shopping. Funds and gift cards also went to the Nashua Children's Home so that special items could be purchased for the children in residence there. Thanks also for bringing in household items for new families. We have used our supply, so if you have pots, pans, dishes, silverware, glasses, bowls, or linens to restock our shelves, please bring them in! We will be celebrate again with a banging of pots by our youth on February 3, Super Bowl Sunday. Several of the youth have volunteered with our third Sunday at the Nashua Soup Kitchen, so they really know where the money goes! In addition to money dropped into the soup pots, our food pantry at the Nashua Soup Kitchen will also benefit from "Soup to Go" offered by the Missions Committee on Super Bowl Sunday. We have heard rumors of chili and vegetable soups, but we will give you updates or you can sniff out the details that morning. It's that time of the year to remind our students away at college how much their Main Street family loves them by sending them a box filled with goodies! The education committee will be packing boxes on March 17. Some ideas are small candies, power/energy bars, gum, etc. This year we are asking again that the congregation refrain from donating chips or other items packaged in similar bags, or liquid items that may leak. We are trying to find the most efficient way to ship the items while avoiding food getting smashed on the way. Thank you for helping us with this annual way to keep in touch! The Front Door Agency has been nominated to potentially receive $5,000 from the Bangor Savings Bank Community Matters More Foundation, but we need your help to get the most votes! Voting takes place online at www.bangor.com/cmm between Feb. 1-28. A gift of $5,000 to the Agency can provide child care and college textbooks for a single mother enrolled in college so that she can become financially independent. It only takes a minute to vote and costs nothing. Each person can only vote once, so please share this with family and friends. Thank you for your support! For more information about the Front Door Agency, please visit www.frontdooragency.org.